Will the education we receive at Izmir University of Economics, Faculty of Law enable us to gain professional skills? Faculty of Law curriculum includes applied courses that will successfully prepare the student for his/her future professional life. Through “Court Applications” course in Fall and Spring Semesters of the third year and Internship at Fall Semester of the fourth year, the students will gain knowledge and experience about prosecution process. The internship during their education will enable the students to gain professional experience and choose their future professions more wisely before their mandatory professional internships such as attorneyship, magistracy, notaryship internships. Why does Izmir University of Economics, Faculty of Law recognized as it concentrates heavily on Commercial Law? Different from other faculties of law, Commercial Law courses at Izmir University of Economics, Faculty of Law begin at second year, and continue at third and fourth years. Also, most of the elective courses consist of courses that are heavily based on Commercial Law courses such as International Commercial Terms (INCOTERMS), Capital Market Law, Competition Law, Law of Banking, Foreign Trade Law, and Intellectual Property Law. 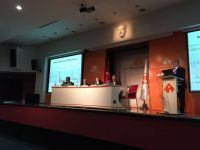 The academic activities such as conferences, symposiums, seminars organized/to be organized by Izmir University of Economics, Faculty of Law at Izmir Chamber of Commerce or at other chambers of commerce, organized industrial zones and at the University heavily focus on Commercial Law. Izmir University of Economics, Faculty of Law also harbours a library that offers numerous national and international books, journals, periodicals, and internet access on Commercial Law. Are we going to have the accumulation of knowledge that will allow us to follow the cases of foreigners when we graduate? The Mandatory English Preparation School and the mandatory Academic Skills Courses in English for four years will allow you to have good command of foreign language necessary to follow the cases of foreigners. 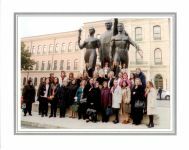 Does Izmir University of Economics, Faculty of Law offer scholarships? 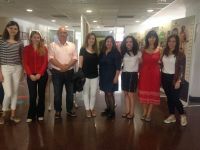 Izmir University of Economics, Faculty of Law awards 10 students with full tuition scholarships, and another 10 with half-tuition scholarships. You may refer to “UNDERGRADUATE AND ASSOCIATE DEGREE SCHOLARSHIPS REGULATION” for other scholarships and opportunities offered by the University. Where can I work when I graduate from Izmir University of Economics, Faculty of Law? 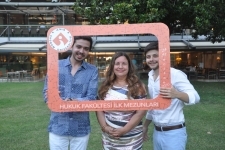 Izmir University of Economics, Faculty of Law graduates, upon completing the mandatory internship, can work as attorney, judge, attorney general, notary, and also seek public service assignments such as governor, provincial district governor. They can work as experts, assistant experts, inspectors at ministries or various institutions as Capital Markets Board Council of Bank Audit and Regulation. They can open their own practice, work as an attorney at public institutions or work at a partnership. They can become a representative for an international legal firm in Turkey. They can provide legal and counselling services to domestic and foreign trade firms in country or abroad. They can work as negotiators or arbitrators. Where is Izmir University of Economics, Faculty of Law located at? Izmir University of Economics, Faculty of Law is located at Balçova Campus of the University. Students are able to meet their needs on campus. In addition to this, the campus having a very central location provides an easy and quick access to many locations. Even though the campus is in downtown city, it is located at a serene place surrounded with natural beauties. Are we offered a second foreign language during our education? The students of Faculty of Law will be able to take a second foreign language course (German, French, Italian, Spanish, Russian, Greek, Japanese, Portuguese, Chinese, and Arabic) during an six-semester period and use it in their professional lives if they want to. Are we going to be trained on legal practices during our education? The internship during their education will enable students to have good command of practices and allow them to choose their future careers. Also, the “Court Applications” course with the participation of expert lawyers during seventh and eight semesters will provide students with extensive information on applications where substantial legal disputes will be resolved so that the students can learn substantive law and procedural law applications. What is the medium of instruction at Izmir University of Economics, Faculty of Law? Education will be instructed in Turkish. Considering the importance of international relations, a year of mandatory English preparatory education and later on “Academic Skills Courses in English” for eight semesters, will allow the students to learn and improve their English for Law, and use the language in their professional lives. Can I be exempt from the mandatory English Preparatory Education? Students who pass the English proficiency exam administered by the University, and students who hold Proficiency Certificates (such as t KPDS, TOEFL, IELTS) that are recognized by YOK (Higher Education Council) can be exempt from the mandatory English Preparatory Education. The dormitory located on campus offers accommodation for students and meets their needs during their accommodation. Can the Izmir University of Economics, Faculty of Law students have double major or minor program? It is possible to have double major or minor programs at other faculties or departments in accordance with the articles of Double Major Program and Minor Program Regulation of IUE (Main page-Regulations). Can I benefit from student exchange programs? 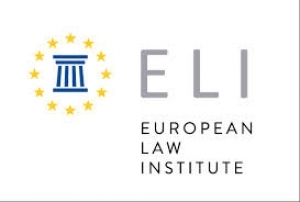 Faculty of Law students can benefit from student exchange programs such as ERASMUS. Are the students allowed to consult the academic staff whenever they want? The students are allowed to talk to or ask opinion of the academic staff whenever they want. Each student will have an advisor who will guide them on subjects such as course selections, internships, exchange programs, and graduate studies, etc. Why should I choose Faculty of Law? An individual, who receives training on law, gets a good command of basic rights and freedoms foremost, and becomes a conscious citizen. An individual, who receives training on law, has an extensive field to work at. What are the requirements for transfer to Faculty of Law? You can apply to make a transfer within the university or from other universities based on the quota determined by the University. You may refer to IUE “Regulations for Transfer on Associate and Undergraduate Level” (Main page-Regulations).